Social media marketing analytic tools have been flourishing since Facebook and Twitter stepped up their brand management game. We can credit platforms like Jive, Buddy Media, Radian6, and others for helping to establish these social networks as integral tools in today’s social media marketing mix. But now that the groundwork has been laid out already, marketers and developers are looking for more powerful and scalable analytics to keep up with tracking the most important engagement opportunities amid the millions upon millions of pieces of content published on a daily basis. 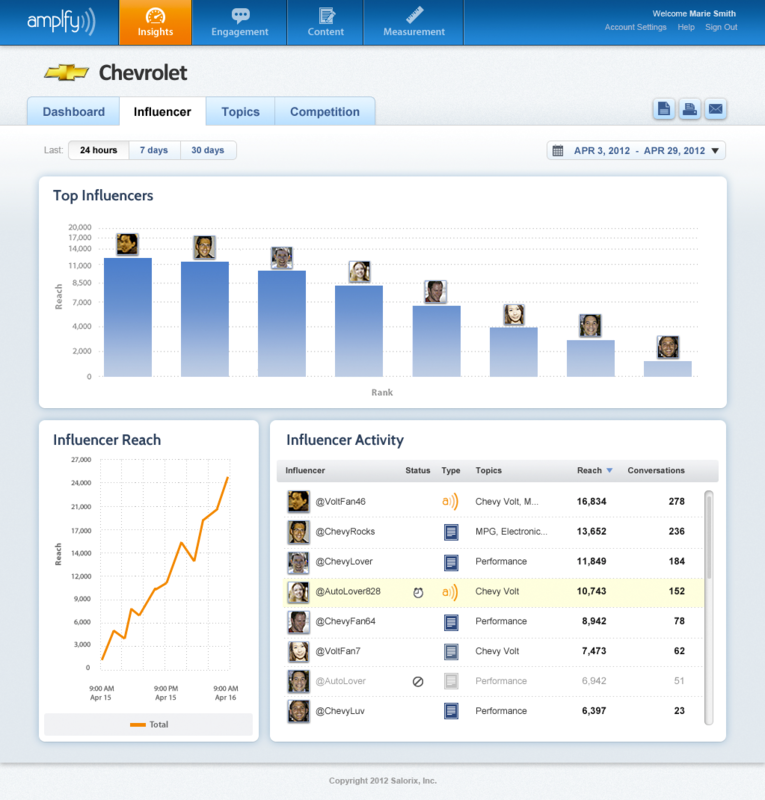 What they’re looking for is social media analytics 2.0, and social media marketing software company Salorix has launched a brand new product called Amplify to do what its competitors have never done before – use artificial intelligence to track and predict influencer behaviors. Amplify’s level of sophistication is way over an average developer’s head, so we won’t boggle you with the intricate details on how it works. And there are proprietary characteristics to its AI that the company can’t disclose either. 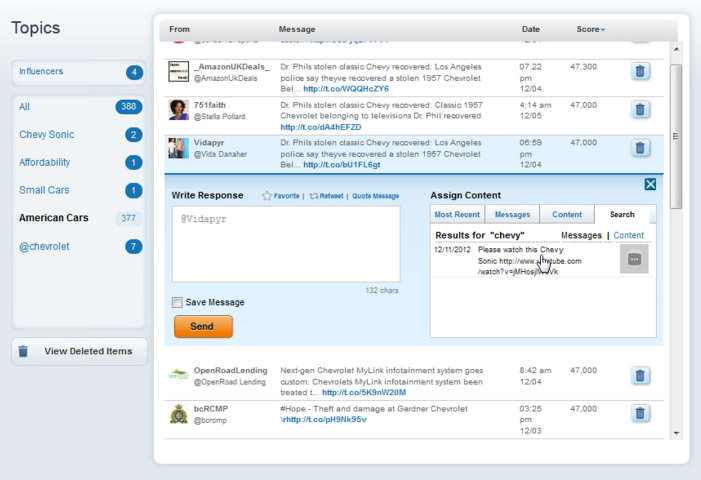 Amplify is like many other social media marketing analytic tools, but it focuses solely on Twitter for now. “It turns out, I think people who are more passionate about products are on Twitter,” Salorix CEO and co-founder Dr. Santanu Bhattacharya tells me. Why risk banking its business on Twitter in the wake of the API restrictions? We’ll get to that later. Amplify uses semantic technology, machine learning, and hand-built taxonomy, which is nothing new but a new way to approach social media analytics. For example, if a Twitter user is going through a midlife crisis and asking friends or followers for suggestions on what types of cars to purchase without specifically mentioning “car” or a type of car brand, there isn’t any tool out there that can automatically realize this as a critical opportunity for a brand like BMW, Audi, Porsche, or other brands to jump into that conversation. 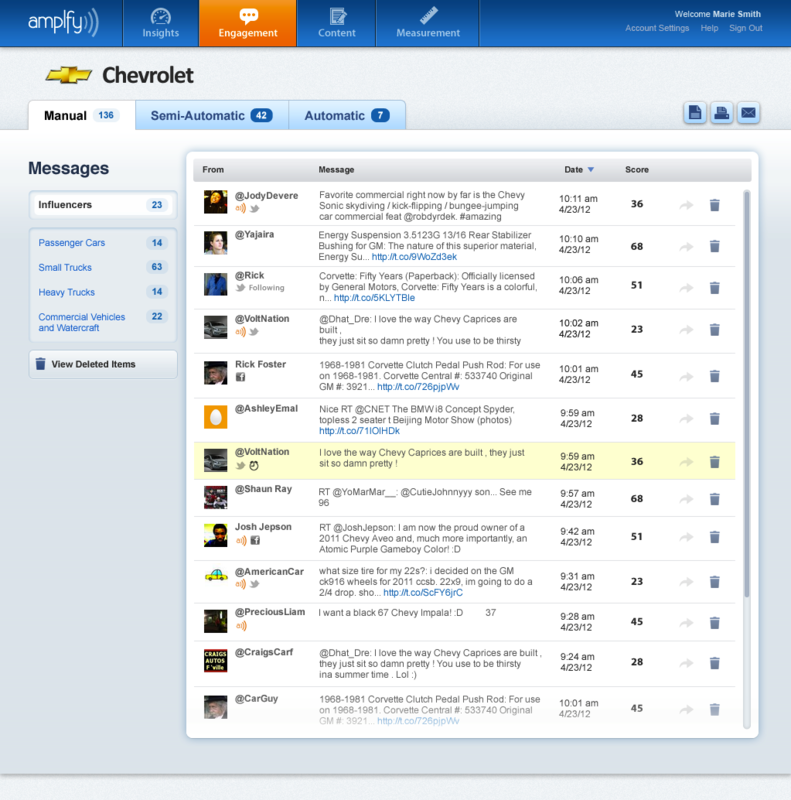 Amplify does this using its artificial intelligence engine powering the platform. And this is scraping just the surface of what Amplify is capable of. The algorithm can profile individual users, granted that they’re among the top 500 users surfaced by Amplify’s AI and recommended to Salorix’s client, and figure out their every like, dislike, habit, and other characteristics. Over time, Amplify learns about these top users individually and can eventually predict what types of content that each user would like. 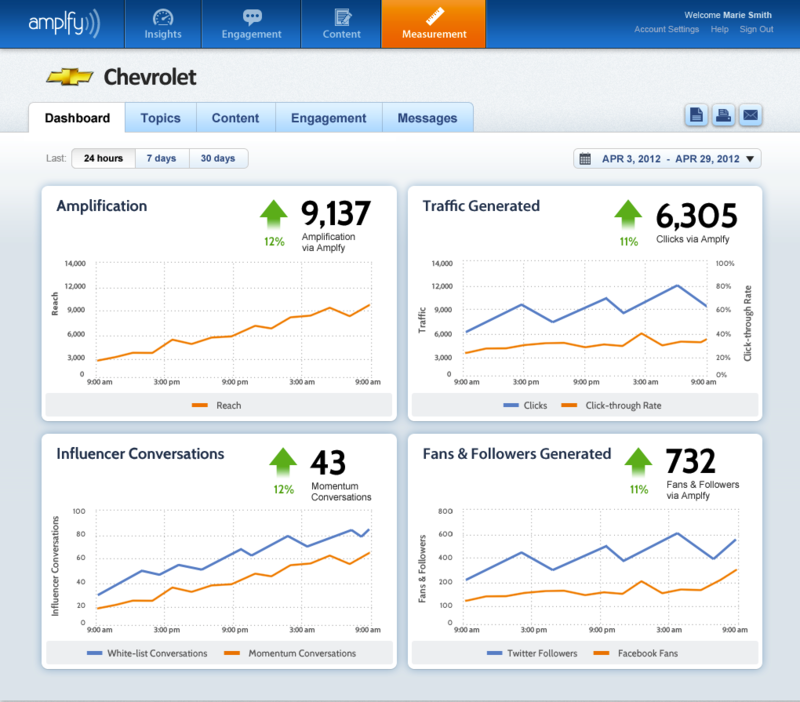 Because Amplify is intended for brands to find the top influencers and interject the brand into conversations, a brand like Chevy can surface the top twenty influencers and reach out to them to suggest or plug their cars for instance. Or, using Amplify’s Buffer-like feature which enables brands to queue tweets for later publishing, Amplify offers a feature to find and recommend the influencers that would most appreciate certain tweets so brands can target these individuals. It sounds oddly big brother, and even Saloroix’s investors were initially worried about the power of Amplify, but Dr. Bhattacharya says that he conducted an extensive study to find out how influencers would react to being profiled before embarking on building the algorithm. Much to Dr. Bhattacharya’s surprise, he found that most users were flattered. Participants argued that if you’re among the top 500 influencers, that what the AI surfaces on any given day for a brand (and depending on the brand’s social media marketing strategy) means it’s possible that you’re going to get some special privileges or are at least appear on a Fortune 500 company’s radar. Wouldn’t you be flattered if Nike, Ford, Chevy or other corporations approached you because of your influence? We don’t see too many of you complaining. The complexity of the product admittedly has its own downfalls. Bhattacharya tells me that right now Amplify isn’t a fit for every type of brand. Amplify has built into it a taxonomy of only seven types of categories, which apparently account for 80 percent of all social media conversations. These categories include cars, insurance, financial services, consumer electronics, food and beverage, entertainment, and begrudgingly, travel. Dr. Bhattacharya says the last category is the most complicated of taxonomies to structure and make sense of. If a brand fits into any one of those categories then Salorix can quickly deploy Amplify. Otherwise it works on a case-by-case basis since it takes between two and four weeks for the AI and its overseeing engineers to input and learn about a new category. Dr. Bhattacharya divulges that Twitter and Salorix have been working closely on Amplify so Salorix has full access to Twitter’s Firehose through the third party data management company Gnip. For now Salroix is worry-free about any Twitter drama, and Dr. Bhattacharya reminds me that Salorix is comfortably situated in the bottom left quadrant of Twitter’s ecosystem – in other words in the business and analytics quadrant, the one that Twitter is okay with. Salroix’s Amplify is the next evolutionary stage in social media analytics, and it’s a product that apparently other existing analytics software providers are now trying to build. But building this new type of analytic platform is resource and labor intensive, so for now Amplify is the only product like this on the market. Initially when social media marketing just started catching steam, there wasn’t enough data that these analytic platforms had to sift through. Social media marketing 1.0 platforms were built to be capable of managing smaller volumes of data. But overtime that volume of data has ballooned to a size where traditional analytics software wasn’t able to keep up. As a social network like Twitter grows, an analytics platform needs to accommodate big data. And to accommodate big data, the software needs to be automated and predictive. These types of social media analytics 1.0 companies have essentially hit a brick wall since its existing analytics platforms aren’t scalable. To build a tool like Amplify would require that existing competitors rebuild their platforms from scratch. And to reach the level of sophistication that Amplify has reached might require Salorix’s team of experienced and high level thinkers that once held positions at NASA, AOL, Yahoo, and Publicis.